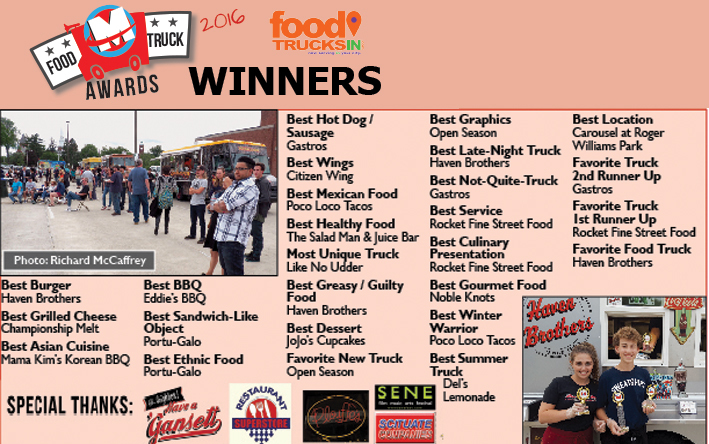 2016 Motif Food Truck Awards Winners! In a burst of activity unusual for a Monday evening, the rooftop of a public parking garage in Pawtucket came to life for the first ever, hopefully annual RI Food Truck Awards. Created by Motif and FoodTrucksIn, the awards featured beer, hula hooping, face and body painting by Art on the Spot, juggling and magic by Marvelous Marvin, puppy love from PARL, mind blowing performaces by Hott Boyz and Sasquatch and the Sick-A-Billys and, of course, food trucks. There were a number of surprises in an evening hosted by Virginia Dunleavy and Eric Weiner. The evening was dominated by the granddaddy of food trucks, Haven Brothers, but a lot of reader love came out for new dogs on the block Gastros. Here’s a full rundown of who you picked in each category. Thank you to all who came out and voted, and who create mobile food! Next post: Motif Local Restaurant Picks!